The Cohiba Robustos Supremos LE 2014 is an exquisite, rich and complex medium-full Robusto, 5" (127mm) long, of 58 ring gauge, and comes in a 10 cigars box. 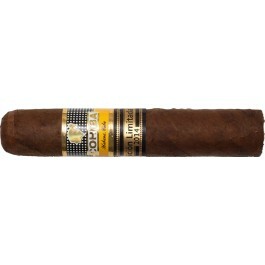 The Cohiba Robustos Supremos is a large cigar, the largest Habanos has ever produced. • Darker, complex cigar with a great flavor profile. The Cohiba Robustos Supremos is the third Edicion Limitada of 2014 of the most prestigious Habanos brand, Cohiba. Aromas of floral, lemon, coffee, cocoa, leather and some vanilla.